Hi all, hope you all are still reading this blog!. It is getting harder and harder for me to keep this place updated. My 18 month old is already in his terrible twos and likes to get into everything. So my cooking has been limited to very basic things and whenever I made something special, I forgot to click pictures!. Ishaan has been asking for chocolate chip cookies for a long time now. I finally baked these raisin and chocolate chip cookies a couple of weeks ago. Since Ayaan loves raisins, I decided to add some to it. I personally loved chewy texture due to the raisins. I prepared these with multi grain flour that I use for making chapatis. 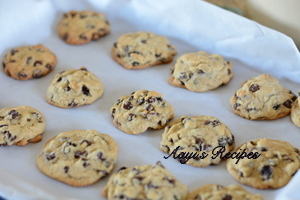 I used Nestle’ toll house chocolate chip cookie recipe and made few changes to it. 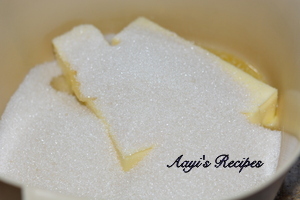 Mix sugar and butter. Then add eggs, vanilla extract. 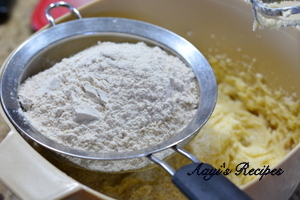 Sieve together flour and soda. 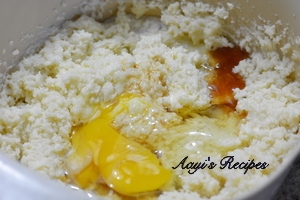 Add to butter and egg mixture. 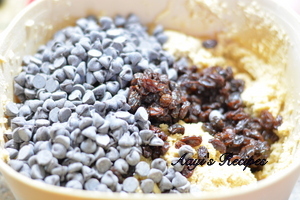 Add raisin and chocolate chips. 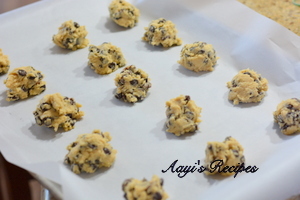 Spread the mix on a sheet and bake. 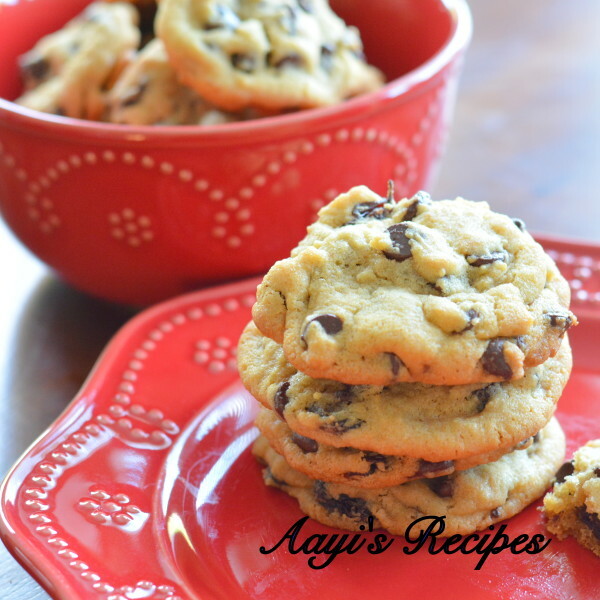 Soft and chewy cookies loaded with raisins and chocolate chips. Combine flour and baking soda in a bowl. I sieve them together in a separate bowl. Then add eggs, one at a time beating them well. Now add the flour mixture, a little at a time and mix well. 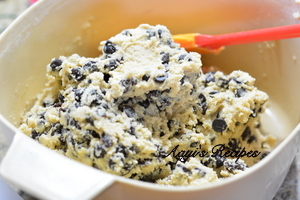 With a spatula, mix in raisins and chocolate chips. Line a baking sheet with parchment paper or grease the baking sheet with butter and flour. Drop the mixture on the sheet by a spoon. Bake at 350F for about 15-18 mins. Let them cool to room temperature and then store in air tight container. I used salted butter. If using unsalted one, add ½ tea spn salt. These look really simple to make and yummy!! Will try these for sure and let you know how it went. 🙂 Thanks for sharing! I baked these cookies.. Tastes really awesome.. Thank you ?.. Have a doubt.. Are these cookies soft or bit hard as say good day biscuits.. These are soft and chewy cookies Veena. If you bake for little longer, they will get some crispiness, but not like biscuits. Looks yummy! All my family members love having cookies with milk and especially the kids. Thank you for sharing the recipe in great detail and with the pictures, gives a clear idea about each step. I would definitely try this recipe in the coming week.